National Military Appreciation Month (NMAM) is celebrated every May and is a declaration that encourages U.S. citizens to observe the month in a symbol of unity. NMAM honors the current and former members of the U.S. Armed Forces, including those who have died in the pursuit of freedom. 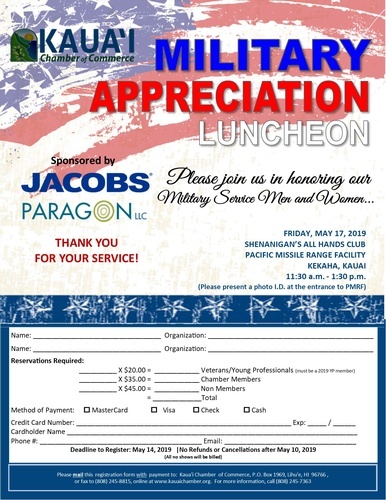 Join the Kauai Chamber of Commerce as we celebrate and Honor all those who serve in our Military at a MILITARY APPRECIATION LUNCHEON, sponsored by JACOBS and Paragon LLC.